As a hedge fund, CTA, or wealth manager, a tear sheet is the one marketing tool every fund manager must have. When working with institutional allocators, family offices, investment advisors and individual investors—your tear sheet is essential to starting the conversation as well as keeping current clients informed. A great tear sheet provides an investor a view of your performance, insight into your strategy, the background of the managers, costs, and risk information in 1-2 pages. Choose from base templates, or a custom design. All tear sheets have different levels of customization. Choose from one of our templates or have us custom design a tear sheet for you. Even our base templates have customizable options. Update your tear sheet in one click. 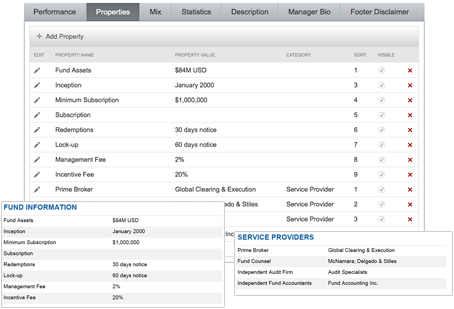 Enter your latest monthly performance, total assets, and click save. Your new tear sheet is ready for download. All statistics, charts and tables are updated in a click. All of the typical information found in a tear sheet is awaiting your input. Select what information to display, customize the display order, location and labels. Don’t see a field? No problem, you can add it on the fly. What makes up your fund? 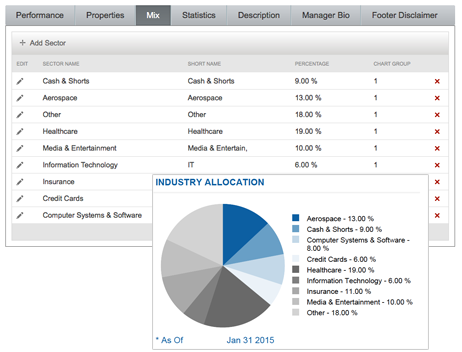 Display the components of your fund as a pie chart for quick comprehension. 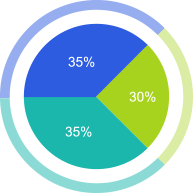 Customize pie charts to show a variety of information. Changes in your marketing? No problem. 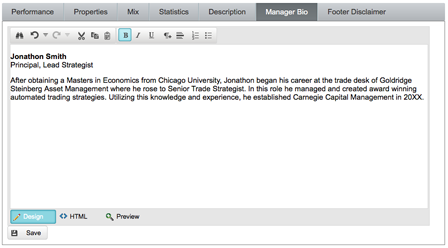 A simple editor allows you to update your fund strategy, manager bios, and other content as you please and view your changes instantly. Select benchmarks that represent your program. Tired of benchmarking against the S&P 500? 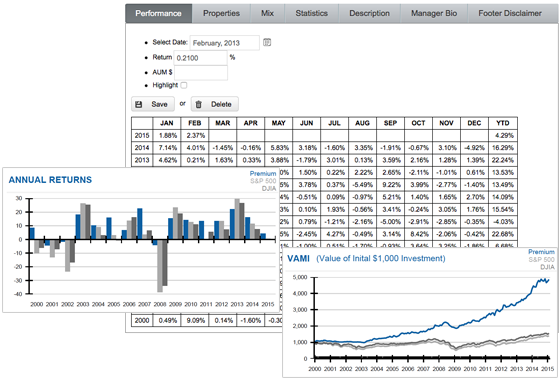 Select indexes that are appropriate to your strategy. We offer a wide selection of ready to use benchmarks: from stock to sector specific indexes such as health care, energy indexes, and more. Using a unique index? No problem. Performance is just part of the story. The time and care you’ve invested in your brand is a reflection of the type of attention you put into your investment strategy. Make sure you’re first impression is a good one. 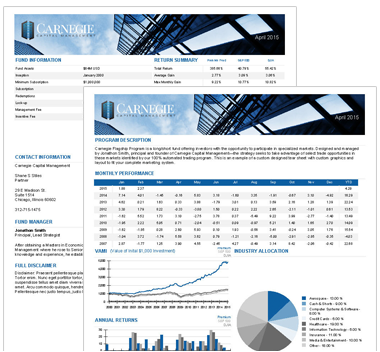 We’ll provide you with an attractive, professional, informative tear sheet customized to fit your fund.